He who would do good to another man must do it in Minute Particulars. General Good is the plea of the scoundrel, hypocrite, and flatterer; For Art and Science cannot exist but in minutely organized Particulars. 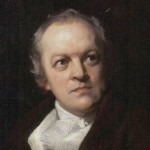 Comments on: "William Blake Quotes: He who would do good to another man must do it in Minute..."
Everything that is possible to be believed is an image of the truth. And we are put on earth a little space that we may learn to bear the beams of love. Painters are noted for being dissipated and wild. When nations grow old the Arts grow cold and commerce settles on every tree.